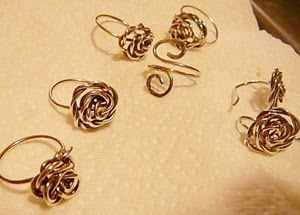 Dana been working hard and created several pieces of them - rose rings and earrings. Ginny added bead dangles on them. I think they are really sweet. Thank you all for sharing. 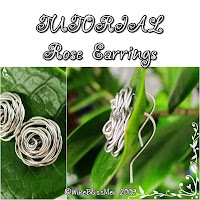 Labels: Earrings , Tutorials for a Fee , Wire Jewelry , z Jewelry Friends n Artists Share it! I bought the tutorial as well but haven't tried it yet...I'll get there though!! !